Beside Dior Minaudiere Holiday 2010 Makeup Collection which will be available October 2010, Dior is also preparing Holiday 2010 Gift Sets. I’m going to show you today only the kits that include makeup products, but there will be a plenty to choose from. If you don’t wanna choose anything makeup related but you still want it to be Dior, then don’t worry because on 1st October products from Prestige series will be available. I’m talking about Prestige Satin Cream (50 ml), Prestige Sating Nectar (30 ml), Prestige Sating Eye Cream (15 ml) and Prestige Lotion (200 ml). Fragrance kits will also be available starting 29 October 2010 and one of the set is Holiday 2010 Dior Addict 2 Gift Set including Dior Addict 2 fragrance (50 ml), Dior Addict 2 Body Lotion (50 ml) and one elegant black pouch. Dior Capture Totale Gift Set will be available from 29 October 2010 and includes Capture Totale Lotion (200 ml), Capture Totale One Essential (10 ml), Capture Totale Balm (15 ml) and one Original Jewel Box. Dior Makeup Gift Sets will be available starting 29 October 2010 in Japan but I’m hoping to see some of these palette also in Europe. 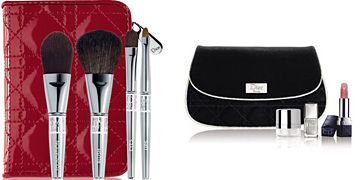 There will be 3 Dior Holiday 2010 Palettes, one Brush Set and one Dior Holiday 2010 Kit including various products and a black pouch. The second palette is Dior Holiday 2010 Eye Shadow Palette which includes 4 mini Dior Color Eye Shadows and one eye shadow applicator. The last palette is Dior Holiday 2010 Lip Palette and as you can see it’s all about lip products. I may not be crazy about lip palettes but at least this one doesn’t mix eye shadow, powders or blushes in the same kit. Do you see anything here that you want to have it as a Christmas Gift? Ooh I might get the eyeshadow palette, it’s pretty! I have bought the big make up palette twice and I never use it, although I did pull out the gloss and mascara, but the eyeshadows are still untouched. I’d go for everything except the lip palette. This is a very cute collection, plain and simple packaging. I’d like to see the Eye Shadow Palette in person. The lip palette looks pretty. I like the packaging too. Simple and classy.